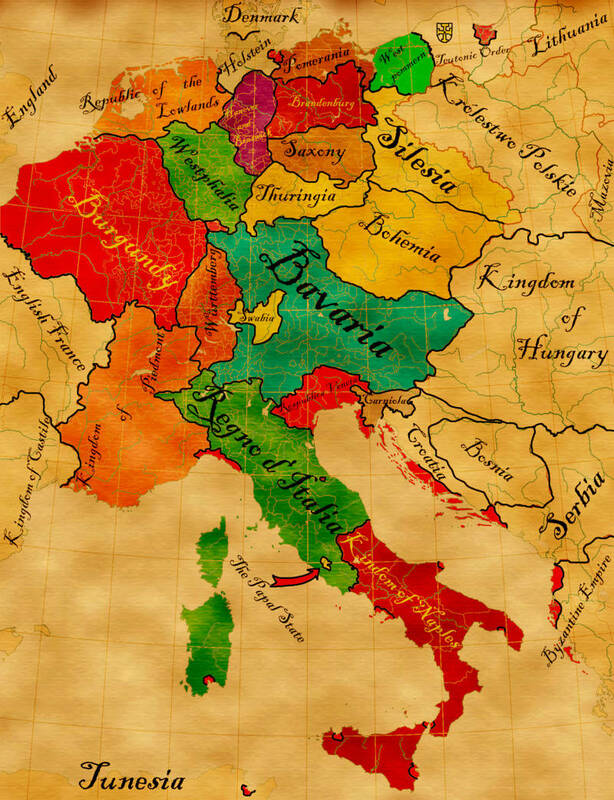 Due to Barbarossa uniting the empire in the 12th century, the dominant dynasty is the “von Hohenstaufen” dynasty. Who pursued a different path than the Habsburgs. They even managed to conquer Carthage (Tunis), which they acquired by winning a trade war against the sultanate of Tunesia and the the mamluk sultanate. The mongols never invade Russia and the Ukrainian steppes. Instead the already existing nomad horde of the Pechenegs gets pushed back to the Volga river by the Russian duchies. With no mongols in Russia, the Byzantines seize control over all of Crimea and fort Tana (Rostov on Don). They also subjugate numerous orthodox tribes in the Krasnodar area. The Byzantines fight wars over the Aegean islands and Crimea against Venice and win all of them, despite the venetians having a larger fleet. With no oppressors or real threats at their doorstep like the mongols, Novgorod expands south, seizing the trade center of Moscow and the famous cities of Ryazan and Tver. They become the dominant power in eastern Europe. Denmark has a personal union with Sweden and proclaims the Scandinavian alliance. This alliance functions kind of like Venice in the Mediterranean, seeking trade opportunities. Poland is now only a minor power, despite its pompous name. Since the Russian duchies are not weak due to the mongols and since they’re not fighting each other for control of a city, the Poles and Lithuanians were not able to subjugate them. Due to the absence of the mongol khanates, Islam doesn’t spread to Russia. So the population is mainly orthodox Christian (Except for Lithuania, the orders, the free cities, Hungary, Poland and Scandinavia). The Pechenegs stay true to their old gods and continue practicing the Tengri faith. As always, keep the opinions coming. Awesome extension to your previous scenario. Personally I think Novogorod was one of the most interesting countries in Eastern Europe since it was a merchant republic outside of Italy which was quite unlikely to happen. Not only that, but Novogorod would probably expand both to the east against the Pechnegs and other tribes and to the west with a much weaker Poland and Lithuania, which would mean the Republican form of government would become much more common way earlier in time than in our timeline, although it would probably not be as democratic as ours. Not only that, but with all these trade centres and mercantilism forms of governments occuring so quickly, it means Europe would develop Capitalism much sooner than ours, which means technology and wealth skyrockets compared to our timeline. I also think without the Ottomans capturing Constantinople and blocking the Silk Route, there is no incentive to find an alternate route to Asia, which probably means North and South American would not be discovered by the Europeans until much later, probably when the Russians (I'm assuming Novgorod would use the title later to better unite the area as they slowly take over more places) expand to the end of Asia and set up trading posts on the West coast of North America. I also think the conflicts between Catholic and Orthodox countries would escalate even further without the common enemy of Islam outside of the Middle East and with two extremely powerful Orthodox countries in Eastern Europe. Mr Trolldemort wrote: Awesome extension to your previous scenario. Personally I think Novogorod was one of the most interesting countries in Eastern Europe since it was a merchant republic outside of Italy which was quite unlikely to happen. 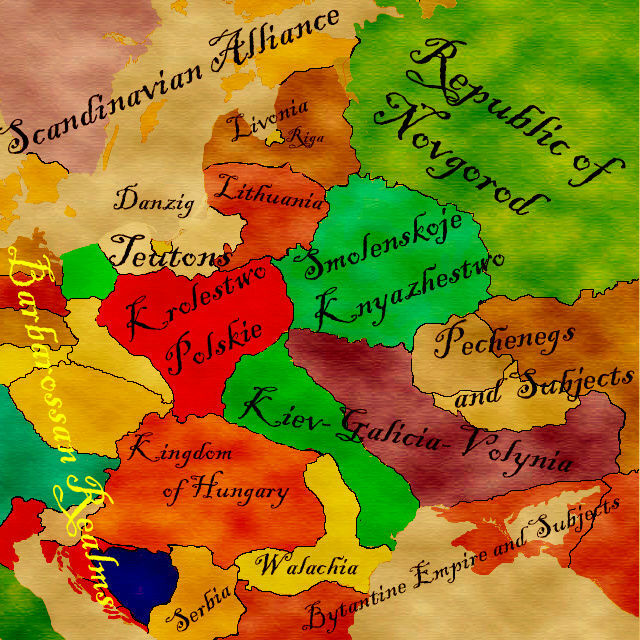 Not only that, but Novogorod would probably expand both to the east against the Pechnegs and other tribes and to the west with a much weaker Poland and Lithuania, which would mean the Republican form of government would become much more common way earlier in time than in our timeline, although it would probably not be as democratic as ours.